Count the houses of worship: From Tyson Street to Tabor in Olney, you can walk a straight avenue of redemption, rising with the sun. Baptist, Buddhist, Catholic, Episcopal, and Evangelical—every people to their house. Only I visit them all, as part of this mester de juglaría, this cycle of irregular meter and spotty rhyme with popular heroes at its heart. When the heroes fall (or are felled) their friends light candles. Their families stagger to front pews, crowned and adorned. Their altar servers let tattoos peek out from under albs as they ring the sanctus bells. And their deacons lay stoles of mourning over bent necks. Sometimes a cop from the neighborhood comes too, and goes to one knee, sensing the need for absolution. Before the candles, before the stoles and bells, before the cop—I get the call. Every people to their duty. This is an epic written in collective, changing every time the street tells it. This is a vernacular cantar de gesta. This is the legend of son, brother, daughter, sister, over whose broken body we spill words and tears. This is, today at St. William, the story of one who lived two decades in the six–eight time of bachata, rumba clave, and gunfire. wielding needle and steel and razored sense of honor. to kill his brother, to change line of succession and game. with güiro and tambora—the beat of their absolute rule. mapping the Kings’ territory, twice tagging new property: Tierra propia. but safeguards hidden in the Kings’ neighborhood. Amor never dealt or used. what is not destined but imposed, she said, as her brother’s skin wept. enchantment of lots drawn at random or planned for gain. Amor exacted a vow from the King who knocked her up. them out of the Badlands to a home on Rising Sun. Amor spread sábila and Spanish on his homeland of scar and brand. It is the way of the low–born wordsmith to break up the story with a bit of puppetry, somersaults, maybe some singing. Today, at St. William, the marionettes dance on strings of Spanish, Khmer–tinged French, and Krèyol. Prayer in the mother tongue is what the body follows into the afterlife. Marionettes are little Marys, and today my tumbleset rolls backwards and forwards to a spritely hymn heard often in this place: Santa María del Camino. Saint Mary of the way, of the paths, of the map of roads we walk, sometimes by force, sometimes by choice, sometimes because they are written on our skin. By the last census, there are about 50,000 people living in Olney. Almost half are Black, more than a quarter are Latino, and another thirteen percent are Vietnamese, Korean, and Cambodian. The young abound; you can sometimes hear the music of Urdu spoken on the street; and though you know Rising Sun Avenue is really named for a tavern, you choose to believe (as Olney’s immigrants do) that it is the boulevard of new beginnings. You hear gunfire in the neighborhood. Maybe Alonso hears the shots too—because the Guatemalans and Dominicans fire guns in celebration. In warning, also, because this isn’t the Kingdom but there are other gangs which prey on their own. Maybe Soky hears the shots—because young Cambodians who aren’t haunted by the genocide and didn’t live through the refugee camps shoot into the air to mark the difference between them and their elders. For sure Louis hears the shots—because he lives next door to three–year–old Juliette, caught by stray bullets as her mother braids her hair on the front porch of their house. When Louis recounts the tragedy to Amor and Alonso, the latter pulls four–year–old Muñeca to him and holds her tight to his chest, exactly where he has inked the talisman of her name onto his skin. Amor, Soky, Muñeca—these three hold real estate on the map that now stretches over Alonso’s shoulders and down to his waist. It is his own map now, even the neighborhoods marked with the crude old scars and tracks scribed by (and for) the Kings. Soky always shakes her head when she runs her hands over his chest and comes to the leafy Khmer letters caught in the gridlock. “You should have asked me before doing this,” she says the last time they are together. Is she irritated? Maybe. Almost a full four years as sweethearts and Alonso hasn’t bothered to learn that Cambodians, too, have a tradition of magical tattooing. “I could have found one of our elders with the power to ink you invisible, to turn bullets away,” she says. They’ve known each other’s bodies a full fifth of their lives. She loves his dimples, the way they strip the years right off him and make him look sixteen again. Such a contrast to the ciphered body, lithe yet ancient. He tells her he is entranced with the arch of her brows—he has never seen anything so naturally perfect. He rests his head on the soft cushion of her belly and looks up at her. “Read something from one of your textbooks,” he says. She sighs, pretends reluctance, but they’re both proud of the fact she went straight from high school into an accelerated pharmacy program. “I’ll read from the chapter about bioavailability and bioequivalence,” she starts, but soon enough they’re giggling at the tedious writing and insipid illustrations, which leads to other, more entertaining distractions. Maybe you follow the sound of shots, and then the sirens of the paramedics. Maybe you follow them to the North Philly ER, which treats more gunshot wounds than any other in the nation. And if you’ve followed, you’ll find Alonso working there. He’s not a nurse, but he hopes to be. And though he’d rather be working pediatrics than the ER, while he cleans he recites gunshot treatment protocols. First, stop the bleeding. Apply direct pressure. Below the armpit, at the bend between leg and hip, on the artery that runs up the neck. Second, if it is a sucking chest wound, find a dressing to occlude. Alonso has seen some victims come in (when someone on the scene knew how to improvise) with driver’s licenses, cling wrap, even cloths smeared with honey sucked in to prevent a collapsed lung. Third, treat for shock. Which might kill you, because it’s almost as deadly as a gun. If you followed this far, and it happens to be a week of graveyard shifts, you’ll see Louis sitting on one of the benches outside the ER, waiting for Alonso to get done. You’ll see them pile in the car, cross back onto Rising Sun, and wake Amor as they noisily get baked in the kitchen; trying to top each other’s boasts about their perfect nieces; talking about the concert they’ll be at, come Friday. Maybe you’ll observe that Louis is a bit sweet on Amor, even when she yells at them for waking her up pre–dawn on the day she’s due to work Macy’s. Maybe you’ll notice the variant of love with which Amor coats the pan in which she reheats the rellenitos de plátano y frijol so the boys will go to bed with full stomachs. “Done with the map?” she always asks. “Yes. As Louis is my witness.” Alonso always responds. And maybe it will be. Soky’s uncle shoots a gun in the air; is arrested, then deported to a country he doesn’t remember. Louis gets roughed up by police because he looks like the kind who would be hiding a gun in the pocket that only ever has held a cellphone. Amor tucks a gun into her handbag after her coworker is assaulted on the subway. Muñeca learns to spell the word gun in preschool because it has only three letters; because her teacher is inexperienced and a bit dim; and because why not? Alonso strokes the guns and bullets etched along the roads the Kings cut into him, markers of old emergency stashes and weapons secreted for a rainy day. These are the dark underpasses of his body, where roadwork took place unchecked and unseen and he inks countermagic—prophylactic, amuletic, sympathetic—to protect those he loves from what he sees coming down the road. One of the five of them will succumb to the sorcery of powder and primer encased in metal and shot with enough force to blow all life out of a small hole. Alonso knows this because, even on Rising Sun Avenue, he carries the blood of a King, and the surnames of those who know that death likes company when it takes to the road. If Louis is hoping Amor will come with them, he is sorely disappointed. She has taken Muñeca to visit her father—the child of ruler and his once–ruled is the passport that might guarantee Amor’s safe–conduct in and out of the Badlands. Louis and Alonso grab their 7–11 Big Gulps, and pile into Alonso’s new car (Scion tC, the payments low enough to manage while juggling nursing school and hospital hours). where the open–air performance venue that is hosting the peace concert sprawls. But Alonso, following that mysterious map of his own, seems to get them lost. At least, that is how Louis sees it, until they arrive. There is already music in the air when they hurry to the gate. Juliette’s mom has given Louis orchestra pit tickets—when will he ever have those again?—in heartbroken thanks for being there from the first. He had been the one to call 911. He had been the one on the porch with her, holding her as she cradled Juliette’s body. Even if now the whole city clamored to be part of the peace concert in memory of the little girl, Louis would always be the first. But they are too late. And no matter the quality of their tickets, their faces are brown and black, and they are turned away from the gate by security. Louis is not angry at Alonso. He can never be angry with this friend who bears a map of sorrows and triumphs, of imprecations and exaltations, of magic and countermagic on his skin. Louis’s map may not be inked, but it’s there on his skin anyway, and that makes them journeymen together. There are others who have not made it inside to the concert either, and since the wind carries for free what they would have elsewise paid for, they congregate in clusters in the parking lot to sing along and dance in place. The music is a siren song. Peace, it dubsteps. Lay down your guns, it bounces. What is heroic is to survive, it raps. After nearly an hour of parking lot conviviality, they find their way back to the car. A man sits on the hood, another leans up against it. “What are you saying?” the man on the hood counters, not moving. Louis has no timepiece, but Alonso looks at his watch and Louis wonders how it is that he hasn’t noticed until now that his best friend’s tattooed map has grown so large it creeps right under his gold watchband and dead–ends midway down his fingers. Three things happen and Louis will never be certain of their order: Hood–sitting man jumps off with a bang; Louis sucker punches the guy who’s grabbed his friend, and Alonso falls heavy on the asphalt. Louis tucks into a Philly shell, a risky defense he’s only practiced with a slip bag, but it doesn’t matter—the guy he’s clocked has about 30 pounds on him and if he comes back at Louis with a strong, quick jab it’ll likely be lights out. But his opponent takes a step back. “Long live the King,” he says, then jogs over to join his partner already halfway across the parking lot. Louis takes a step, grasps Alonso’s outstretched hand and pulls him up. Blood covers his friend’s shirt and pools on the ground. Louis turns his face—so much blood—and lets his friend slide back down to sitting. The clusters of thwarted concert–goers draw away from Louis’s frantic 911 call, draw away from the map inking itself in bloody culverts and catch basins on the parking lot. When Louis turns back to look at him, Alonso is tipping sideways, helpless to hold himself upright. Louis guides his body down, cradling his head until it rests in the cushion of his lap. His hands come away bloody. Blood is stronger than ink, Amor used to say to Alonso, and Louis hopes it is true. He drags his fingers over what smooth ground he can reach without jostling Alonso. He draws a clear roadway for the EMTs—coming here, circling, then back again to the familiar ER with its gunshot wound experts. The blood scribbles look a bit like his aunt’s chalked vévés, a bit like his grandmother’s tau cross with its crudely etched laudes, and a bit like a busy intersection on Alonso’s chest. He doesn’t stop until Alonso reaches over to still his hand. “It’s enough,” he says. Alonso’s laugh makes him open his eyes again. His friend’s are darker than nickel–blacked ink and Louis can’t hold his gaze. He looks instead to where people are still nervously hanging in loose clots, looking over when they pause in their incessant texting. He’s pretty sure some of them are snapchatting everything. Louis nods, but it isn’t really assurance. Women almost always outlive men. Alonso knows it, and Louis knows it, and no magic or vow is strong enough to change that knowing. Alonso stops talking then, but Louis can feel the rise and fall of Alonso’s chest in his own body, and he counts the minutes, first singly, then collectively, then in the time signatures of the songs he sings under breath. Midway through his terrible rendition of Enrique Iglesias’ and Romeo Santos’ Loco—Amor’s favorite song of the moment—Louis feels Alonso drop from 6/8 time to 3/4 and then out of rhythm. The first responders are too late. When they arrive, sirens blaring and lights flashing, the music center’s security people finally come out from behind their barred gate. Louis climbs into the front of the ambulance and persuades the EMTs to take Rising Sun Avenue on their way to the hospital where Alonso will be declared dead. The world spins eastward, like the tires of the ambulance. And the sun starts its jornada, its work day like any other. The city is full of small holes through which life has been blown away the night before—why should the brilliant, heedless orb stop for this one? In the hot, dim church where Amor cries, I juggle the photos of memory. First the sibling selfie. They are smiling together in Alonso’s car the day Amor quits dancing and starts Macy’s. This is the most popular photo, the one that will go round and round in my hands until it is as familiar as prayer. I toss in the one of Alonso and Soky dressed for the prom—all muted golds and browns—like the manifold face of Rising Sun itself. Another shows Alonso ringside at Louis’ first amateur bout, yelling, fist–pumping, still dressed in scrubs from his hospital shift. And next, a close up of Alonso cradling the tiny, perfect, two–day–old Muñeca. I rotate these three photos, swapping them in for each other in several passes. Love for love for love, the way blood circulates through the multiple chambers of the heart. The fifth photo I’m juggling is Alonso alone, tattoo–sleeved arm in the foreground, the Kings’ early marks of possession and the boy’s talismanic attempts to stay clear are evident to my eyes. This is the photo the newspapers use. Because: young brown man. Because: gang ink. Because: alone. Because: the story they want is cheap and familiar. I go from tossing to a different style of juggling with the last photo— the one that I cannot put out of my mind, the one with which I will not break contact. It is black–and–white, taken a year after the escape from the Badlands. Alonso’s arm is around Soky and they look like young hip hop stars in love—she, luminous and so young; he, soulful and, for the moment, unguarded. How do promise and hope coexist with prophesy? It is the map on Alonso’s bare chest that catches my eye, and holds it, and won’t let me stop juggling the story. Churches fill slowly, empty fast. are nothing but pews and shadows when I finish. like memories do, when the journey’s done. and it leads them here, to the green where it ends. Yo, the ghosts are ours. you must pay your debt to the itinerant. in items too precious to pawn or reddit. Death will keep the tally. or some other avenue of redemption. in the place they call Rising Sun. Sabrina Vourvoulias is the author of Ink (Crossed Genres, 2012), a novel that draws on her memories of Guatemala’s armed internal conflict, and of the Latinx experience in the United States. It was named to Latinidad’s Best Books of 2012. 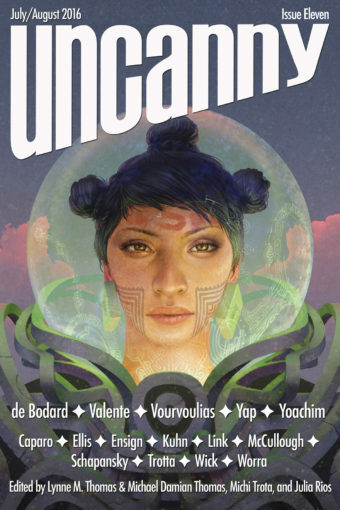 Her short stories have appeared at Uncanny Magazine, Tor.com, Strange Horizons, Crossed Genres, and in a number of anthologies, including [email protected] Rising (Wings Press; Goodwin, ed. ); The Year’s Best Young Adult Speculative Fiction 2015, and Long Hidden: Speculative Fiction from the Margins of History (Fox and Older, eds.). She is freelance bilingual journalist and editor; her pieces have appeared at Philly.com, Philadelphia Magazine, City and State Pennsylvania, NBC Philadelphia, Telemundo 62, and The Guardian US, among others. Follow her on Twitter @followthelede.